We chose Anne Sullivan’s name to pay tribute to an Irish immigrant who came to prominence as a teacher of people who were deafblind in the United States. Anne Sullivan’s parents Thomas and Alice Sullivan left Limerick during the famine and settled in Massachusetts, where Anne was born in 1866. At only five years old, Anne contracted an eye infection and began losing her sight. Three years later, Anne’s mother passed away and she and her younger brother were abandoned by their father and sent to an Alms house in Tewksbury. Whilst there Anne persuaded an inspector with Massachusetts Board of State Charities to sponsor her education at the Perkins School for the Blind, where she became one of the most promising students and graduated as Valedictorian of her class, aged 20. During her time at Perkins, Anne learned to communicate with friends who were deafblind, including Laura Bridgeman the first person who was deafblind to be educated. It was a skill that would come in handy when, in 1886, she was hired by the Keller’s to care for their daughter Helen in Alabama. Helen was a profoundly challenging student but Anne was determined to the point of obsession. Helen eventually learned to communicate by touching Anne’s face to feel the vibrations from her nose, lips and larynx. Despite repeated attempts to save her sight, some of which were partially or temporarily successful, Anne was visually impaired for most of her life and completely blind by 1935. 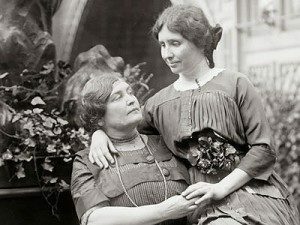 Anne Sullivan served as Helen Keller’s educator for over 50 years and accompanied her to Radcliffe College where she became the first person who was deafblind to graduate with a Bachelor of Arts Degree. The pair remained lifelong companions and when Anne died in 1936, Helen was holding her hand. Anne’s ashes were interred at the National Cathedral in Washington D.C. making her the first woman to be recognised for her achievements in this way.